The Eastern White Pine, Pinus Strobus, is a beautiful landscape pine extensively used throughout much of North America. This evergreen conifer tree is a truly magnificent tree attaining a height of 80 feet at maturity with a diameter of two to three feet! It carries long, soft bluish green needles with large brown cones. Eastern White Pine grows rapidly for a pine tree and is pyramidal shaped when young, becoming umbrella-shaped with age. This pine takes six to eight years to produce a six-foot tree on good sites. It grows best in full sun or partial shade and in ordinary soil; can tolerate wet, swampy areas. When planting, space 6 ft. apart for screening purposes. Eastern White Pine trees are widely used as a screen or windbreak, are long-lived and vigorous. 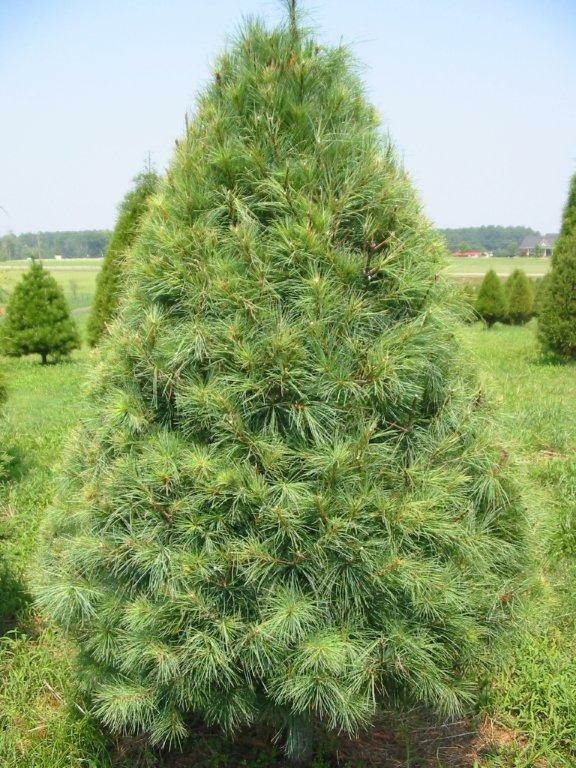 The Eastern White Pine is easily controlled, and it is good for small properties as well as field plantings. This beautiful tree is also widely used as Christmas trees!